Anchoring in beautiful bays off islands, meeting up with friends last seen 9 years ago, being chauffeur driven in a limo (perhaps that is an exaggeration for a 22 year old Opal Corsa/ Holden Barina), dropping into local markets and sampling wines in small boutique wineries. Such has been our week on Katherine. Hard life, hard week in the office. But as they say someone has to do it. So we set of from Marseille in not so nice seas on Saturday 13th May heading for a group of three islands east of Toulon collectively called Iles d'Heyres. 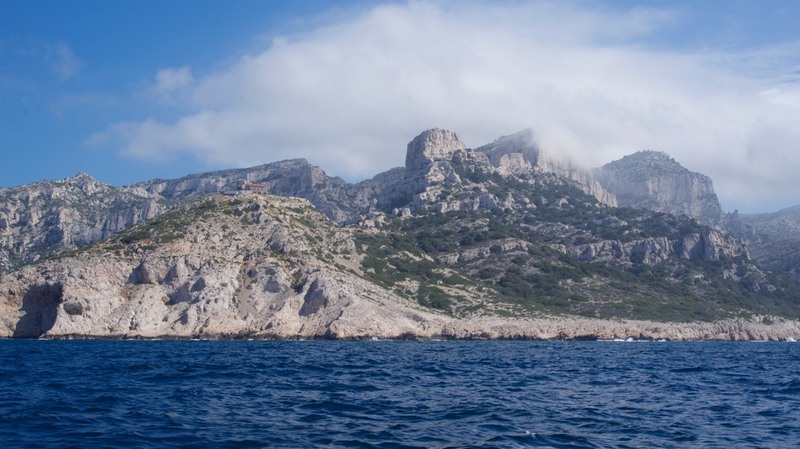 As we headed out of Marseille we passed the Parc National Des Calanques which was equally dramatic from the sea as it had been from the land when we drove through the area the previous week. As we passed Toulon the number of yachts on the water increased dramatically. For the first time in a while we weren’t the only sailing boat on the water. We anchored our first night in the bay off Plage D Argent and although we looked like we were a long way out from shore we were actually anchored in only 6 meters of beautifully clear water. 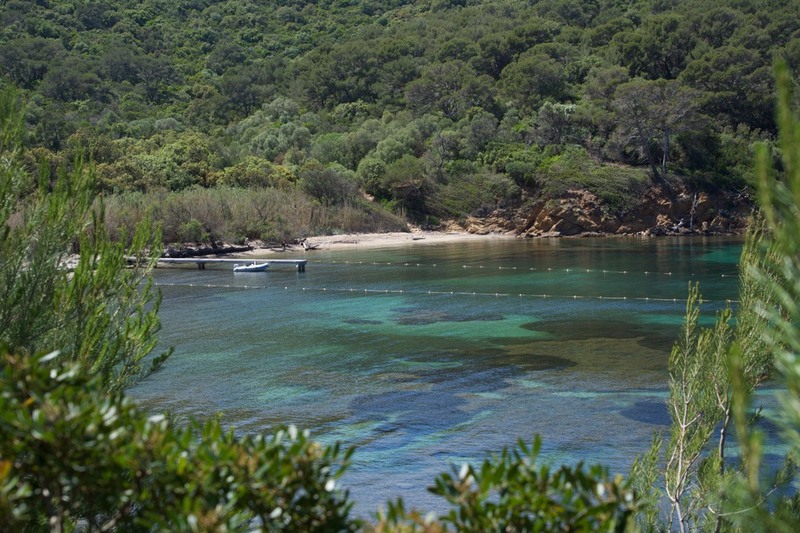 Porquerolles is the largest of the three islands in the Iles d’Heyres group measuring some 7km long by 3km wide. 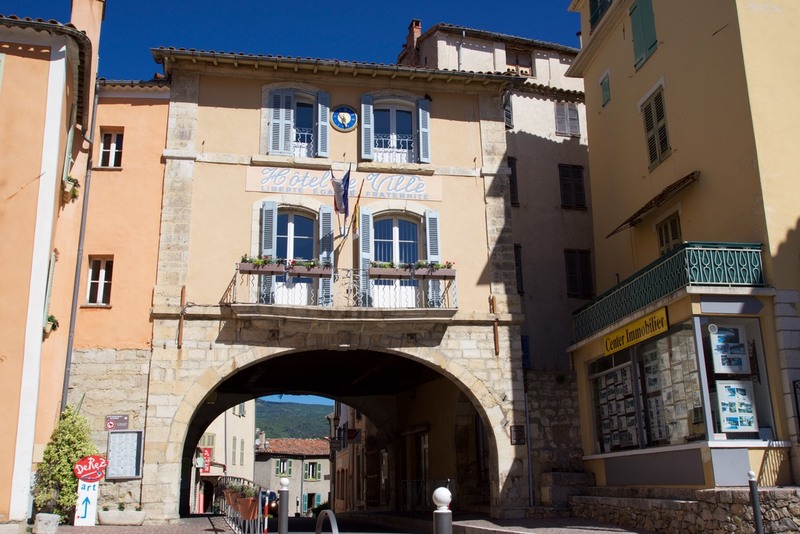 It has a small village that was established in 1820 as a retirement town for Napoleans honoured troops. It was then brought in 1912 by a Belgian Adventurer and Entrepeanur who set about planting vines and producing regional wine. In 1971 80% of the island was brought back by the government to form a National Park and prevent further development. The result is an oasis that people can escape to for day visits, hike, ride bikes and if your lucky as we were anchor out in the beautiful bays. After two nights in our first anchorage we moved all of 1nautical mile to anchor off Playa De Cortade with its view of Fort Saint Agathe. 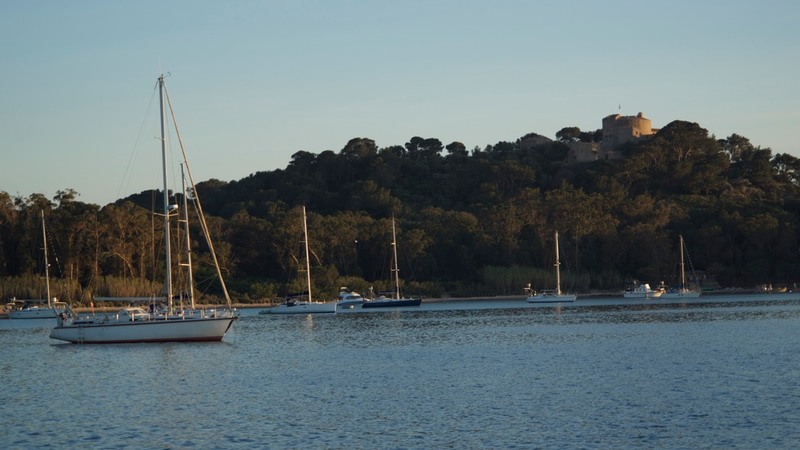 The next anchorage saw us move onto Port Cros a small dedicated National Park Island with a beautiful anchorage that had been restricted to protect the sea grass. A peaceful anchorage unless someone drags anchor and knocks on your bow unannounced! 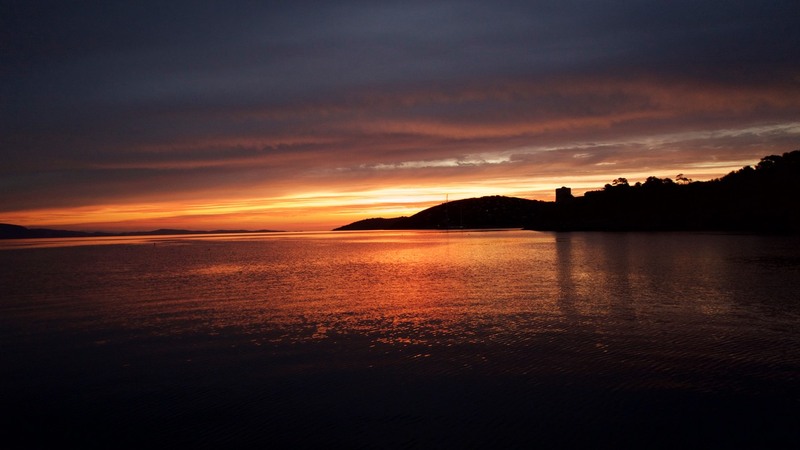 We enjoyed two nights here walking and paddle boarding and were treated to a spectacular sunrise on the morning of our departure. The third island of the group Ile du Levant. We did not visit this island as it is mostly out of bounds having been established as a defence base. 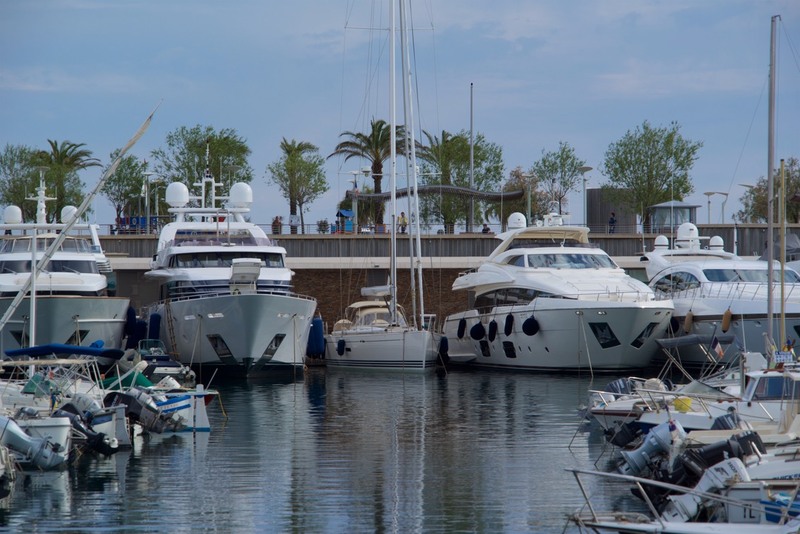 So from anchoring in beautiful bays it was back to the reality of big boats in the Cote D Azur as we arrived into the harbour of St Raphael and found ourselves literally tucked up between two power boats. 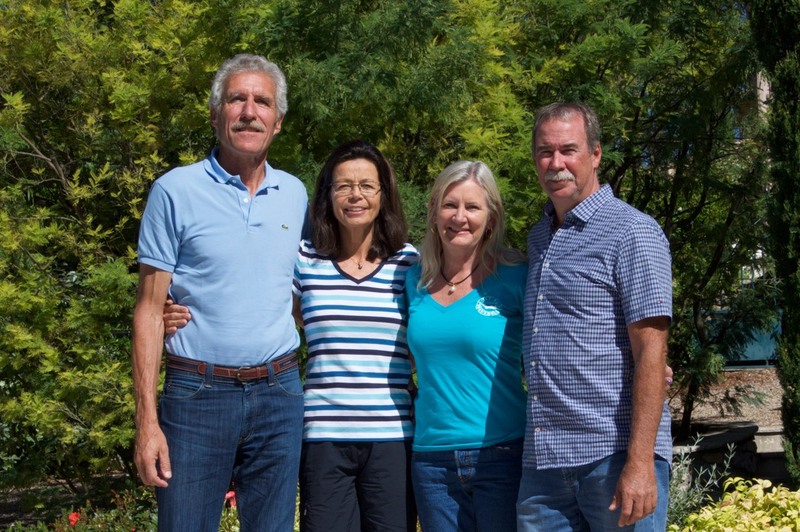 On Friday 19th we were joined by Lillian and Rudy Zeller who we had first met in Bundaberg around 2008 when they were sailing around the world on their yacht Shiva. As luck would have it they had just returned to their home in Bagnols-en-Forêt just a short distance from St Raphael. It was over 9 years since we had all met but it felt like just yesterday. And so it came to be over a cup of coffee onboard Katherine that a plan was hatched and before we knew it we were off on a two day tour hosted by Lillian and Rudy in their trusty Opel Corsa. 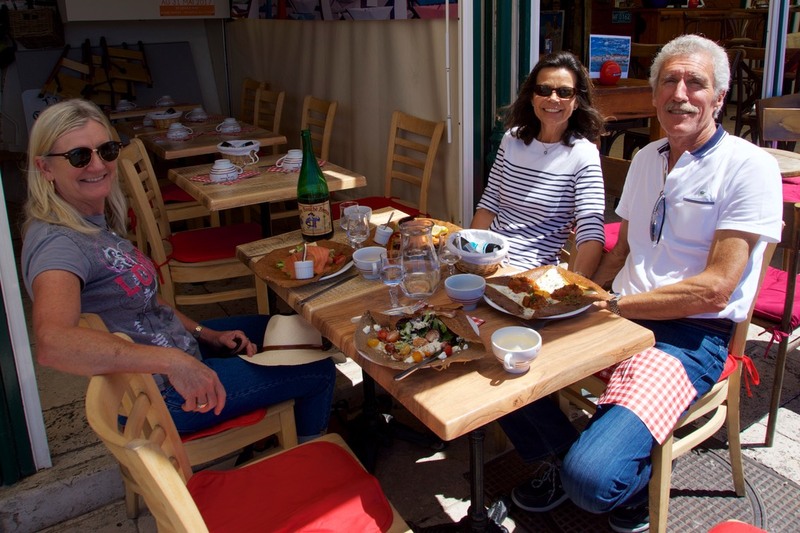 First port of call was St Tropez to enjoy a lunch of crepes and Brittany Cider - the “holiday" was officially underway. Until the 1950’s the fishing village of St Tropez with its north facing aspect had been relatively untouched by the tourist seeking sun on the Cote D Azur. 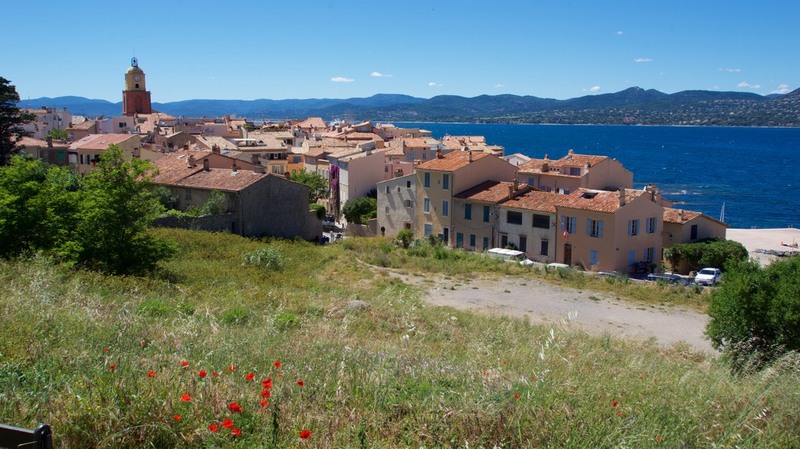 It attracted painters and writers in the 1800 and early 1900s and was bombed heavily during World War Two when the beaches around St Tropez were used for Allied Landings. But its establishment as a place to be and be seen arrived in 1956 when Bridgitte Bardot was filmed in “And God Created Women’ in St Tropez. Today the fishing harbour is filled with large boats, the esplanade lined with cafes and restaurants. 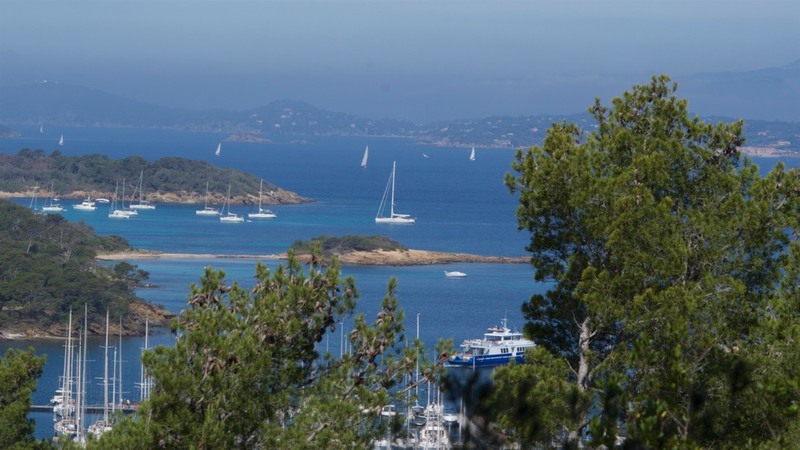 But what we found surprising was the low key nature of St Tropez, it was a real pleasure to wander the streets around the old fishing port of La Ponche, watch locals play pétanque (Boules), and to take in the view of the town and surrounding bay from the hilltop. 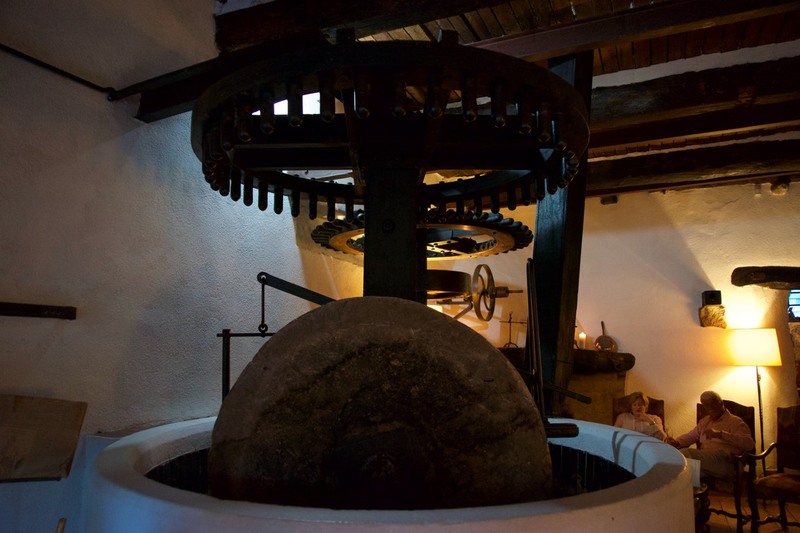 Friday evening we dined at Restaurant Moulin De La Cammandoule - an old olive mill that has existed in one form or another since the 15th century. Outside of the mill stands the remains of a Roman aqueduct that once brought water to the mill from the river Camandre. Inside all the working elements of the mill remain and according to the restaurants website could be swung into action and operational within a fortnight. The food and service did justice to such a unique setting. Saturday morning we headed for the market in the nearby town of Fayence, for some delicious tasting olives, cheese and cured meat. 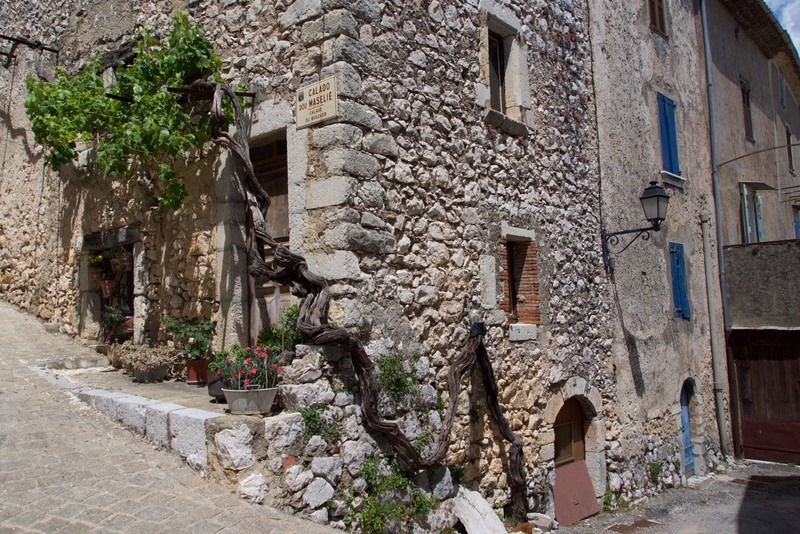 We then drove on to the town of Mons where we walked the twisted streets finding a terrace under an olive tree on which we could sit and enjoy our lunch of French Bread whilst looking out over the valley. 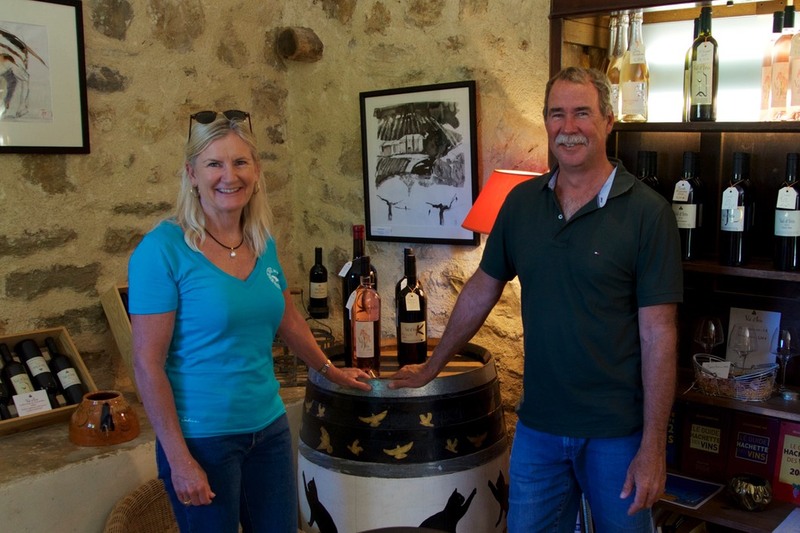 A special meal cooked for us on Saturday evening at Lillian and Rudy's home in Bagnols-En Foret finished for us what had been a very special tour of this area of Provence. We returned to Katherine on Sunday - after just one more winery stop. Well stocked with wine, groceries onboard courtesy of Rudy’s now "catering services", it was time to depart St Raphael and move a little further east. We certainly will make sure it is not another nine years before we all catch up.